My role in the world of organics and conservation started with buying veg for an organic box scheme back in 2000 and has grown from strength to strength from there. I have continued learning and experiencing the pros and cons of cultivation, nourishing and nuturing soil, encouraging nature as well as producing, growing and developing wildflowers and different habitats ever since. The environment is a fascinating and vital part of our future. I would like to play a part in preserving it helping people to understand, appreciate and enhance their environment. 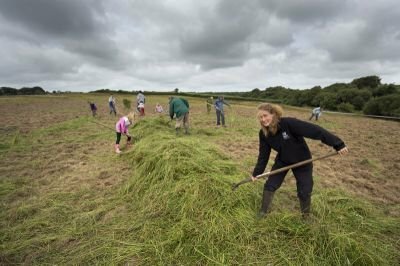 My roles with Cornwall Wildlife Trust and Neal's Yard Remedies (NYR) have helped me to share my knowledge and passion with staff, visitors, volunteers, general public and Fox Club members (the junior section of Cornwall Wildlife Trust). Events that have included work days in the garden, guiding volunteers with practical tasks and teaching children through play has provided me with experience of customer focus. Working closely with the Soil Association to maintain the organic status of NYR land and the Woodland Trust to enable the Jubilee wood are just two examples of working with partners to achieve environmental goals. As a lover of all things outdoors I am prepared, and do, work in all weather conditions. I am good at working alone as is often the case with my gardening business; Natural Gardens. I also enjoy working as part of a team.